Our professional upholstery cleaning technicians can expertly take care of all upholstery fabrics, including silk, wool, cotton and many more. We perform the upholstery cleaning using professional grade equipment for maximum results with no risk of damage to the fabric. Our technicians will work carefully and with attention to fine detail in order to give you the best cleaning results at the best possible price. In most cases, our cleaning technicians will perform the upholstery cleaning on site in order to save customers’ time and money. In some other instances, the technicians might suggest that for best results the upholstery should be taken to our specialized cleaning plant where the cleaning can be performed accordingly. In order to make this process as swift and hassle-free as possible our cleaning crews can pick up the upholstery from your home and have it delivered to the cleaning plant. Once the cleaning is finished, we will arrange for the freshly cleaned upholstery to be delivered back to your home. Upholstery fabrics processed at our specialized site can receive anti bacterial and anti allergen treatments, we can also arrange for anti odor and wear protection of all fine fabrics, even silk. Our cleaning crews can take care of all upholstery sizes; there is no task too big or small for our crews to handle. All jobs are approached with due care and attention; our technicians have sufficient prior experience and plenty of technical knowledge to be able to review the state of the fabric, determine the level of soiling or damage and in turn administer the most appropriate and effective way to clean the fabric. Certain types of upholstery will be taken for off-site treatment, but customers can be sure they will have the fabrics back as soon as possible, and in excellent condition. People who are unfamiliar with specialized upholstery cleaning choose to dispose of these particular pieces of furniture instead of seek professional cleaning help, we recommend to have our cleaning crews review the upholstered pieces and suggest a cleaning method which will be effective and sparing on the fabric. We specialize in the professional cleaning of all types of upholstery. We will not shy away from cleaning even the most sensitive and demanding fabrics and materials such as silk, wool, cotton and many more. In order to provide our customers with the best cleaning results, at the right price and with no risk of damage to their fine fabrics we use the latest and most efficient, professional grade equipment in order to perform perfectly every time. Our cleaning technicians are well trained and have sufficient technical knowledge to assess the fabric’s condition and to determine the best way to clean it without damage or discoloration. In most cases, our people will be able to perform the cleaning on site, but if necessary they might suggest that the upholstery fabrics be taken for processing to our specialized cleaning site. As we aim to make our services as convenient and streamlined as possible, customers can have our cleaners pick up and bring the upholsteries to our cleaning plant for treatment. After the cleaning is finished, our people will deliver the clean upholsteries back to the customer for extra convenience. Upholstery fabrics processed at our specialized site can receive anti bacterial and anti allergen treatments, we can also arrange for anti odour and wear protection of all fine fabrics, even silk. Life is complex enough as it is and we know that swift, efficient cleaning service is just what people need so we aim to cover as much of your special cleaning requirements as possible. 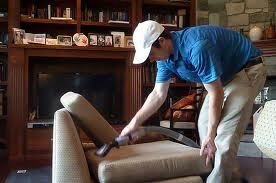 Our cleaning experts will be able to handle any type of upholstery cleaning task big or small. The nature of the cleaning equipment we use gives the ability to clean all sizes of upholstery even the smallest of pieces. Many people who are unfamiliar with the upholstery cleaning options we provide are willing to throw out a valuable piece of furniture rather than attempt to clean it but we say give it to us and we will make sure you have it back clean, fresh and in the shortest time possible. We specialize in the professional cleaning of all types of upholsteries. Most of the time our cleaning technicians will be able to perform exceptionally well on-site and achieve the desired results without much fuss. In some instances though, the cleaning experts might assess the situation and determine that for best results the upholsteries should be taken to our specialized cleaning site for additional treatment. As we understand that taking the upholstery fabrics to another location is extra hassle for our customers we have a special pickup and delivery service in place as to make things as swift and easy as possible for our customers. Our cleaners will come and pick up the fabrics in a suitable time and take them to our cleaning plant for proper treatment. Naturally, we will take expert care of your upholsteries and use our sufficient technical knowledge to achieve top cleaning results with no risk of damage to these delicate fabrics. The cleaners will review and assess the type of fabric, the level of soiling or staining and will in turn administer the best and most appropriate way to clean the upholstery. Once the job is done, we will organize for the freshly cleaned upholsteries to be delivered back to your home and fitted right where they were. Upholstery fabrics processed at our specialized site can receive anti bacterial and anti allergen treatments, we can also arrange for anti odour and wear protection of all fine fabrics, even silk. We use professional equipment at our treatment site which allows us to handle upholsteries of all sizes, even the smallest pieces of fabric are no problem for our machines. We know that taking the upholsteries off site is somewhat of a problem for customers so we will try and have the fabrics returned back to you in the shortest time possible and in excellent condition. We recommend for customers who are about to part ways with a furniture piece which looks tired and worn, to consult with us first as will likely be able to revive the old upholsteries and save you hundreds in new furniture.